NUCCA stands for National Upper Cervical Chiropractic Association and is a specific technique practiced by only a small number of qualified practitioners. It consists of a gentle touch and controlled contact on the first vertebrae in the neck designed to restore balance to the spine. Even though the primary focus is the neck, the effects of the correction influence the whole spine and all body systems. This is because the NUCCA procedure influences one of the highest control centers over body balance: the brain stem and central nervous system. The C-1 vertebrae, also known as the Atlas, is a small donut-like bone located at the top of the spine and the base of the skull, surrounding the brain stem. 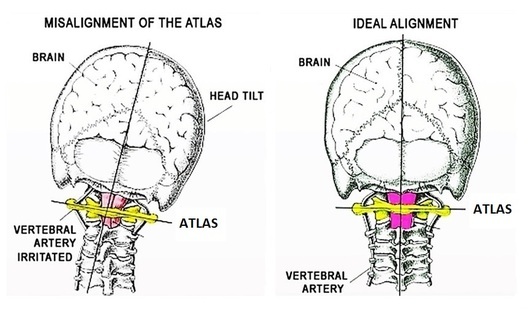 When the spine is subjected to stress, the Atlas can become misaligned. This phenomenon is known as the Atlas Subluxation Complex Syndrome or the ASC Syndrome. 1. Control and regulate all vital functions, including circulation, breathing, and digestion. 2. Activate muscles, allowing us to move. 3. Allow us to sense, perceive, and feel. 4. Relate us to the world outside ourselves by way of learning, experiencing, and behavior. Who is Trained to Deliver a NUCCA Correction? While there are many upper cervical techniques, Dr. Arnone has 28 years of practice experience with NUCCA. Using this experience, he has worked closely with Dr. Farmen for the past several years and Dr. Farmen now utilizes the NUCCA technique to optimize patient care as well. Our office currently has the only two doctors in North and South Carolina capable of performing the NUCCA adjustment. Many patients travel multiple hours to receive this treatment at our office. If you're interested in learning more about NUCCA, please don't hesitate to give our office a call!